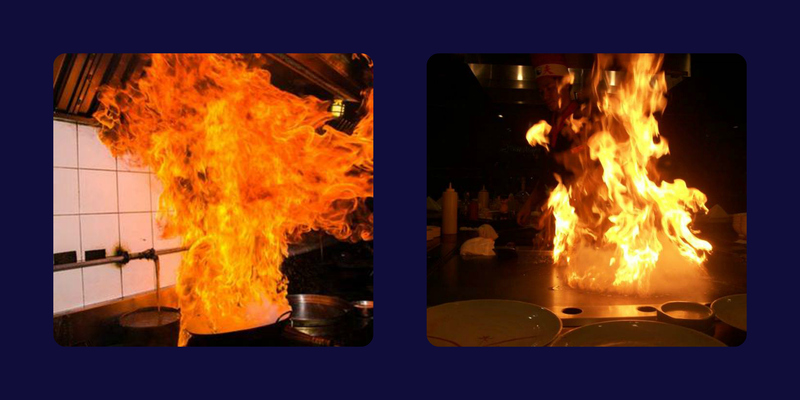 Fires that occur in restaurant kitchens typically involve electric, gas, or solid fuel cooking appliances. Determining where the fire started on the cooking line is only one part of the investigation. Equally important is the evaluation of the restaurant hood, fire extinguishing system, and exhaust duct as they relate to the growth and spread of the fire. Although other types of suppression systems are permissible, this article addresses properly functioning wet chemical extinguishing systems. A properly designed, installed, and maintained wet chemical extinguishing system should extinguish an incipient fire very quickly, resulting in minimal damage from smoke and the extinguishing agent. A kitchen that experiences a fire under a hood with a wet chemical extinguishing system should be operational in as little time as it takes to recharge the system, replace fusible links, and clean the appliances and floors. If a fire spreads beyond the hood, the functionality of the entire system should be questioned. A typical commercial cooking operation consists of the cooking appliances, a Type I hood, an exhaust duct, an exhaust fan, and an extinguishing system installed in the hood over the appliance line. The hood, duct, fan, and extinguishing system operate as one entity. If one of the components is impaired the entire operation may be compromised. It is important to have an understanding of the design objective, overall operation, and applicable codes and standards relating to the restaurant fire suppression system, the hood and duct, the exhaust/ventilation system, and various other components of the operation. Ultimately the responsibility for the care of the systems is that of the owner or the owner’s designated representative. It is the owner or owner’s representative’s responsibility to place the various systems and components into the care of qualified individuals. This will ensure that the systems and components are inspected, tested, and maintained in accordance with prescribed schedules, which are outlined in applicable codes and manufacturer’s manuals. General housekeeping plays a big role in the proper function of systems. Although the exhaust/ventilation and extinguishing systems are being maintained, often the appliance line is unkempt. In many cases the appliance line isn’t being cleaned, appliances have large grease deposits on them, and weekly inspections aren’t being performed by the kitchen staff. This can contribute to the ignition of a fire and growth of the fire. A lack of prescribed maintenance is often a contributing factor in the failure of a hood system to extinguish a fire allowing it to extend beyond the hood and exhaust/ventilation system into other parts of a structure. Some insurance companies have language in their policies requiring that the owner or owner’s representative must maintain the commercial cooking operation in accordance with the applicable codes or face the possibility of a claim being denied. Just as the contractors and manufacturers who maintain systems and provide system components are held to industry standards, so too are the commercial cooking operation operators. The extinguishing system is required to be inspected by a qualified contractor at six month intervals. The hood and exhaust/ventilation system is cleaned and inspected based on the type of operation and volume of cooking. The cleaning company should be advising the kitchen operator on how often the hood and duct should be cleaned. The cleaning company should also be evaluating the condition of the hood, exhaust duct, and exhaust fan. The appliances and other cooking line components are also required to be maintained in accordance with the manufacturer’s installation and service manuals. When a service company determines that a system is impaired, the system should: code quote be tagged as non-compliant. When notified of an impairment or deficiency it is the responsibility of the owner or owner’s representative to promptly have the problem corrected. In the event of a fire that is not contained to the appliance line it is important to get the right personnel get involved as early as possible opportunity to assess the loss. All too often experts are retained long after the loss, after repairs have been completed, damaged components have been thrown out, potential parties haven’t been interviewed and/or notified, and no information has been collected. Identifying the potential parties is important on both the subrogation and defense side of any claim. Determine the cause of the loss may be almost impossible months or years after the fact if proper steps to aquire information and preserve evidence are not taken.